What do we do? Maybe we do what we would for any ailing loved one. We bring them nutritious food. Their numbers are dwindling. More die than are born; and eventually our orcas may pass beyond all recovery. 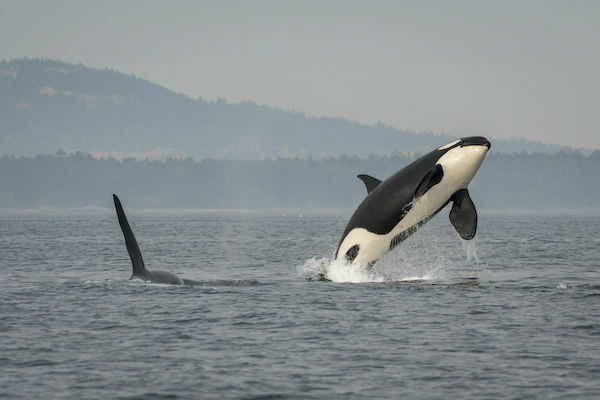 The Southern Resident Killer Whales -- a group of three family pods that fish the waters of the Salish Sea -- are among the most studied animals on earth. We have identified and named each of the 75 remaining individuals of the three pods, J, K and L. We know they hunt mostly through echolocation, a process disrupted by the noise of ever-increasing marine traffic. We have catalogued a toxic cocktail of chemicals concentrated in their bodies. We know that of all the salmon, they seek out the Chinook, the largest, requiring about 30 a day to stay healthy, and they're not finding them. We know there hasn't been a successful birth since 2015, and we know the reason: They're starving. But knowing is not seeing. For the most part their struggles have been invisible, hidden underwater. Their plight, though well understood by science, hasn't necessarily been felt by the broader public. That changed on July 24, when Tahlequah, (J35) broke the surface of Salish Sea with her dead calf draped over her snout, beginning what came to be known as the Tour of Grief. As the world watched transfixed, whale researchers confirmed the gesture was indeed what it appeared, a mother grieving the loss of her baby, and that such events typically last a day or so. Three days later Tahlequah was still bearing her calf through the Salish Sea. Then it was six days, then 10. In the end, with the help of her family, she carried her calf for 17 days and 1,000 miles, gathering the affections of millions of people along the way, and astounding scientists. Veteran whale researcher Ken Balcomb suggested that Tahlequah might be trying to send us a message, to communicate to us the orca's dire situation. The lost calf was, after all, a female, a potential child-bearer and of special significance to a group on the verge of extinction. Was Tahlequah mourning the death not only of her own child, but also the dying of her kind? We can't know, and it doesn't really matter. The statement is there. Tahlequah showed us what extinction looks like, and as sad as her vigil was, it was enlightening, for now we see just what sort of creatures we're on the verge of losing. Since 1998, 61 Southern Residents have died, while only 38 have been born and survived. And so the question: What do we do? Maybe we do what we would for any ailing loved one. We bring them nutritious food. "Chinook abundance is manifestly not sufficient to feed even today's perilously low orca population," notes Joseph Bogaard, Save Our wild Salmon Coalition. "Starving whales don't lie. At best, hatcheries may be helping to keep an already inadequate food supply from getting significantly worse, but they are not meeting the orcas' nutritional needs." In the case of Tahlequah and her relatives, that means freeing a river. In particular the lower Snake River, where four concrete dams prevent this ancient lifeline of the Salish Sea from delivering its medicine: big, fat, Chinook salmon. The Snake River, a major tributary to the Columbia, was once one of the most productive salmon habitats in the world. Shaped like a ladle, it cups the eastward bulge of the Rocky Mountains in Montana and Idaho, gathering vast flows of cool, mineral laden water and sending it, along with drainage from the Columbian plateau, northwest through Hells Canyon and across the loess of Washington, before emptying into the Columbia. As late as the 1930s, even after dams had been built on the upper reaches, fall runs of half a million Chinook were still pouring toward the Columbia. But by 1990, after a total of 14 dams had been laid across the river, only 78 salmon made it as far as Lower Granite Dam, the fourth dam in the chain. It's this dam, and the three behind it, that hold the key to the river's recovery and the orca's future. Above them lies a rich and intricate watershed of prime Chinook spawning streams, large enough to actually deliver a meaningful amount of Chinook to the orca, enough perhaps to fatten them up so they can successfully raise some babies, their only hope for survival. Today, only about 1 percent of the historic number of fish return. More than 200 large dams on the basin's rivers are the major cause of its salmon extinction crisis, with 13 populations now listed under the Endangered Species Act. Yet the Columbia-Snake Basin still holds more acres of wild land and miles of wild river than any watershed in the lower 48 states. It is this opportunity for salmon and steelhead recovery that we offer the last best hope for a substantial increase in prey availability for Southern Resident killer whales during the critical winter months. For 20 years conservationists have been calling on the Army Corps of Engineers, which owns and operates the dams, to breach them and restore the lower Snake River. And for 20 years, the Army Corps has resisted. Even worse, a coterie of Northwest lawmakers have introduced and passed legislation through the U.S. House that attempts to legally cement the dams in place, and prevent restoring the Snake. They do this even though these dams no longer serve their original purpose, which was to get inland agricultural products to coastal ports and markets. That can be done just as easily by the trains running along the river. As for electricity, a recent study concludes combined output of the four dams could be produced as cheaply, or more so, by a mix of renewables. We also know that dam breaching works. When the two hydroelectric dams crossing the Elwah River on the Olympic Peninsula were successfully removed in 2014, wild salmon returned almost immediately, appearing as if out of nowhere, in numbers far exceeding scientific projections. Remarkably, the federal government agrees this is the best option for the salmon and has said so. In its 2000 plan, NOAA National Marine Fisheries Service agreed, "Breaching the four Lower Snake River dams would provide more certainty of long-term survival and recovery than would other measures." Since there are no practical impediments to removing these dams, we see that the real holdup is bureaucratic, and political. It's administrative inertia and turf protection; and it's moneyed interests and an increasingly hardened stance against the natural world. But all that was before Tahlequah's journey. Now the emotional, even moral landscape has been altered in some significant way. Next week, the governor's Killer Whale Recovery Task Force gathers in Anacortes for its second-to-last meeting. Will the task force members be emboldened and put dam removal front and center of their recommendations? "The recommendations from the task to the governor must be bold," Bogaard said. "They must break away from the types of actions and strategies that have brought to where we are today. Doubling down on business as usual will fail orca and our state and region. Big changes are needed." On Sept. 7, a massive flotilla will gather outside Yakima, bringing people together from all over the region to demand removal of the four lower snake river dams. Of special significance, this year's flotilla will be Indigenous-led, with canoe families from sovereign tribes across the Northwest. One cannot image a better way to honor this moment and gather the human will around both orca and salmon. For me, what Tahlequah did touched on mythic. It was as if for 17 days the meanness of the present political moment was transcended by an enormity of love and grief we had no idea existed. How do we answer her odyssey but by doing something big and courageous ourselves? How else but by freeing her a river?